Tell Us About Post-1970 Lower 48 Oil Production? Fifty years ago this week, on March 8, 1956, at a meeting of the American Petroleum Institute in San Antonio, Texas, M. King Hubbert, in the preprinted version of his prepared remarks, had the following statement, “According to the best currently available information, the production of petroleum and natural gas on a world scale will probably pass its climax within the order of a half century (i.e., by 2006), while for both the United States and for Texas, the peaks of production may be expected to occur with the next 10 or 15 years (i.e., 1966 to 1971).” As more and more people are learning, Lower 48 oil production, as predicted by Dr. Hubbert, peaked in 1970, and it has fallen fairly steadily since 1970. Kenneth Deffeyes, in Chapter Three of his recent book, “Beyond Oil: The View From Hubbert’s Peak,” described a simplified way of predicting the production peaks for various regions and for their subsequent declines. One simply plots annual production (P) divided by cumulative production to date (Q) on the vertical axis, or P/Q, versus Q on the horizontal axis (see Figure 1). Stuart Staniford, on The Oil Drum Blog, has described this technique as “Hubbert Linearization” or HL . Using the HL technique, Dr. Deffeyes, an associate of Dr. Hubbert, predicted that the world crossed the mathematical 50% of Qt mark on December 16, 2005. In other words, Dr. Deffeyes believes that the world is now where the Lower 48 was at in the early Seventies. Given this prediction, we wondered how accurate has the HL technique been in predicting post-peak cumulative Lower 48 oil production. 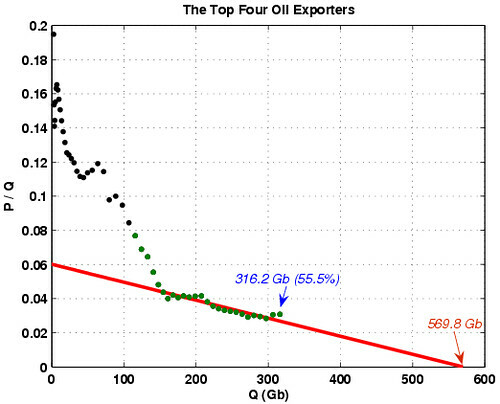 Also, what can the Lower 48 model tell us about the future of world net oil export capacity? Finally, we have a recommendation, a fundamental shift in US tax policy. 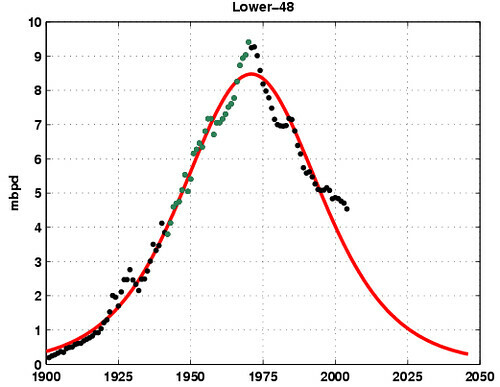 We generated a HL plot using annual data from 1942 through 1970 using data from the EIA . This plot predicted a Qt of approximately 196.1 Gb (Figure 1). We then converted the data to the typical production versus time plot (Figure 2). Fig 1. Hubbert Linearization technique applied to the Lower-48. Only the data between 1942 and 1970 are used to perform the fit (green points). Fig 2. 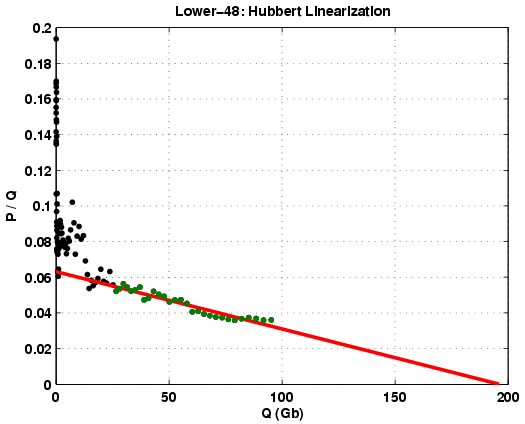 Lower-48 production data and logistic curve resulting from the Hubbert Linearization technique. Using only 1970 and earlier production data, the HL plot predicted that post-1970 Lower 48 cumulative oil production would be 78.5 Gb, which is 98.7% of the actual post-1970 cumulative oil production (79.5 Gb). Note that actual oil cumulative production was slightly less than what the HL plot predicted. This suggests that we can almost certainly place a good deal of confidence in Dr. Deffeyes’ prediction that the world is on the edge of a permanent and irreversible decline in conventional oil production. If the Lower 48 were the sole source of crude oil for the world, for every two gallons of gasoline that the world bought in 1970, we would be bidding for one gallon today. 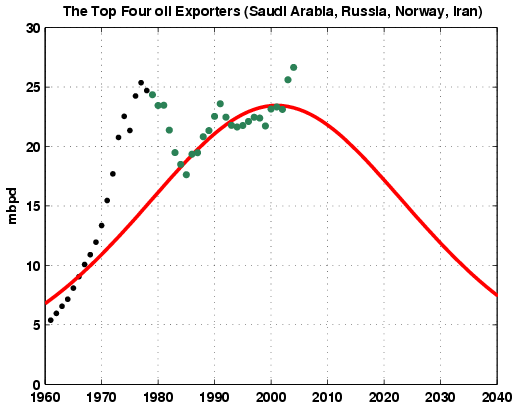 According to the EIA, in 2004 the top four net oil exporters were Saudi Arabia; Russia; Norway and Iran, collectively accounting for more than half of the net exports from the top net oil exporters (those with net exports of one mbpd or more). Using all available data, we generated a HL plot for the sum of the production from these four countries, deriving a Qt of 569.8 Gb (Figure 3). We then generated a production versus time plot (Figure 4), showing the historical and predicted future production for all four countries. Note that based on the HL analysis, these four countries are collectively about 55.5% depleted. Keep in mind that the Lower 48 analysis was 98.7% accurate in predicting post-1970 cumulative Lower 48 production (using only data through 1970). Fig 3. Hubbert Linearization technique applied to the total production of the top four oil exporters. Only the data between 1979 and 2004 are used to perform the fit (green points). Fig 4. Sum of the top four production data and logistic curve resulting from the Hubbert Linearization technique. A critical point to keep in mind is that an exporter can only export what is left after domestic consumption is satisfied. Consider a simple example, a country producing 2.0 mbpd, consuming 1.0 mbpd and therefore exporting 1.0 mbpd. Let’s assume a 25% drop in production over a six year period (which we have seen in the North Sea, which by the way peaked at 52% of Qt) and let’s assume a 10% increase in domestic consumption. Production would be 1.5 mbpd. Consumption would be 1.1 mbpd. Net exports would be production (1.5 mbpd) less consumption (1.1 mbpd) = 0.4 mbpd. Therefore, because of a 25% drop in production and because of a 10% increase in domestic consumption, net oil exports from our hypothetical net exporter dropped by 60%, from 1.0 mbpd to 0.4 mbpd, over a six year period. We are deeply concerned that the world is probably facing an imminent and catastrophic collapse in net oil export capacity because of declining production and increasing domestic consumption in the top exporting countries. Figure 4 predicts that the combined oil production by the current top four net exporters will be reduced by 50% by the year 2028, which would probably equate to a reduction in net oil exports of at least 75% over the next two decades. 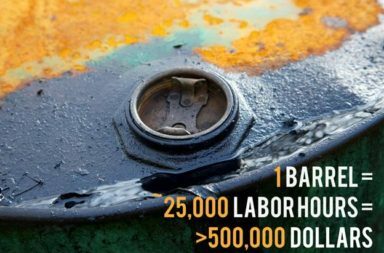 As the reality of declining conventional oil production sets in, enormous amounts of capital and energy will be allocated toward nonconventional oil reserves in an effort to try to keep the supply of liquid transportation fuels–gasoline; diesel and jet fuel–growing. The principal effort will be focused on very heavy oil, bitumen (tar sands) and coal liquefaction. These nonconventional sources will help, but the key point to keep in mind is that we are merely discussing increasing the rate of extraction of fossil fuels. The question we have to ask is whether the enormous amounts of capital and energy might be better spent on renewable energy projects. In any case, we predict that nonconventional sources of oil will only serve to slow–and not reverse–the long term decline in world oil production. Some have argued that the suburbs are dead; the suburbanites just don’t know it yet. It’s probably more accurate to say that the suburban commutes are dead; the suburban commuters just don’t know it yet. 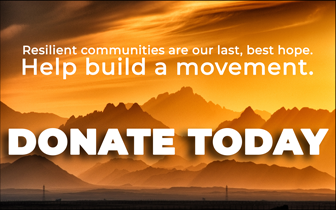 We recommend that the United States abolish the payroll tax (Social Security + Medicare tax) and replace it with either a liquid transportation (petroleum) fuel tax or an overall (nonrenewable) energy tax. The majority of American households pay more in the payroll tax than in the income tax. This would be a tax cut for most households and it would a massive tax increase on those who are profligate in their use of energy. No matter where one lives, the cost of goods would go up, but if you lived close to where you work, your effective tax rate would go down. Of course, those who persisted in long commutes would pay the price. There would of course be very powerful forces opposed to this idea–the housing industry; auto industry; airlines; trucking–the list goes on. But the fates of these industries are sealed. It’s not a question of if they will contract; it’s just a question of when. The sooner it happens, and the sooner these industries start emphasizing energy efficiency, the better off we all will be. A high gasoline tax does not necessarily equate to a lower standard of living. Norway, with the highest gasoline tax in the world, has the highest standard of living in the world, perhaps partly because their car ownership per 1,000 people is about half of what it is in the US. There would be some other benefits. As we turned to walking, biking and mass transit, our health would improve. There is pretty much a linear correlation between obesity rates and total miles driven (here in the US, we are the world champs in both categories). In addition, since this is in effect a consumption tax, everyone who now avoids paying Social Security taxes would no longer be able to avoid paying them. However, the primary reason for implementing the proposal is that it would cause an immediate and massive across the board push for greater energy efficiency and it would unleash enormous free market forces against profligate energy use. Khebab has a Masters Degree in Physics and a Ph.D. in signal processing. He is currently a researcher in a computer vision lab in Quebec, Canada, with ten years experience in R&D. Jeffrey J. Brown is a licensed professional geoscientist responsible for the discovery of several oil and gas fields in west central Texas, and currently managing an exploration joint venture. He’s authored numerous articles with a special emphasis on global oil exports. Commentary: Why is Saudi Arabia not a Threat to Fracking? Commentary: Is it only a question of when the US once again becomes a net oil exporter?